Discussion in 'Coin Chat' started by Bonedigger, Jan 27, 2006. Since they are both made of the same alloy - I doubt it has anything to do with chemical makeup. I have always attributed it to the fact that Morgans have a different surface finish than Peace dollars. The surface of a Peace dollar is smoother than that of a Morgan which is what makes the Morgan appear more lustrous - it really isn't, it's just a different luster. 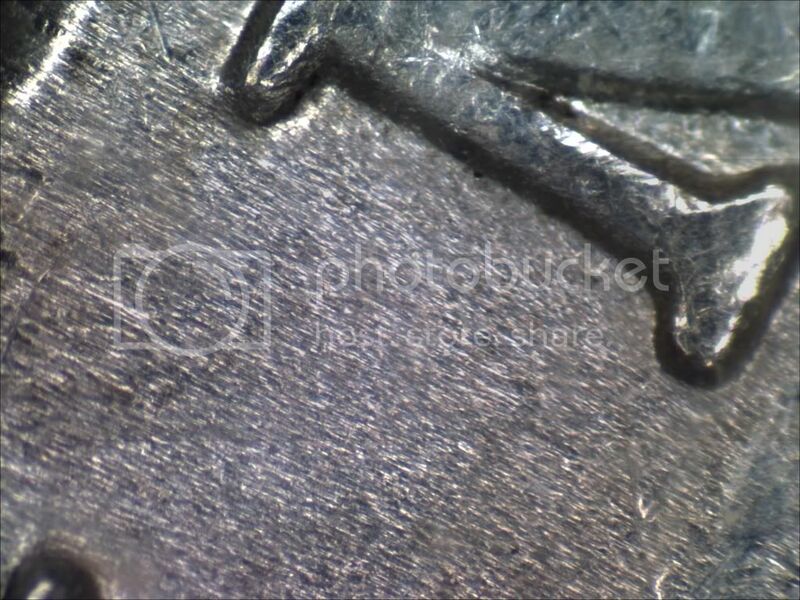 The luster is the result of the flow lines on the surface of the coin. 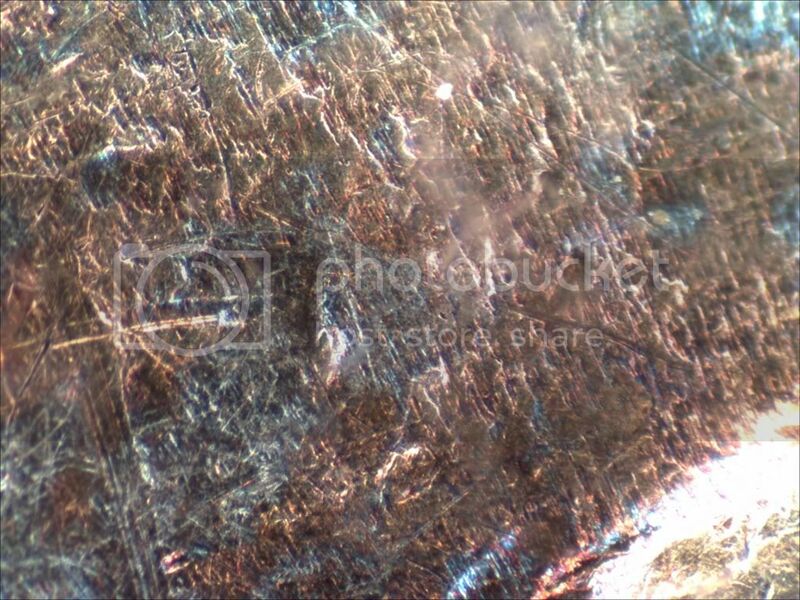 And if you examine a Peace and a Morgan under high magnification you will see the surface of the Morgan is rougher than that of the Peace. I attribute this to the die preparation and improvements in technology. I believe that the surface of the dies ( which is what creates the flow lines ) for the Peace were polished smoother than the Morgan. Because the flow lines on a Morgan are deeper than the flow lines on a Peace it exposes more surface area of the silver to the air. Thus the surface of a Morgan tones more readily and deeper than a Peace does. Anyway - that's my simple explanation for it. I've noticed that the morgans I have tone darker than the peace dollars. I just thought it was because they are older. All of that said - what happened when they released the Franklin and Kennedy 90% silver half? Did they forget all of those technology improvements and die prep changes (not that I mind)? I am not trying to argue the point or disagree (because it sounds reasonable) but I have seen some really nicely toned Franklin's and Kennedy's. I guess I will have to put that new microscope to work.?. I am glad this topic came up. I always wondered why the luster on the Morgan and peace dollars were different. For the record I prefer the luster on the morgans better. 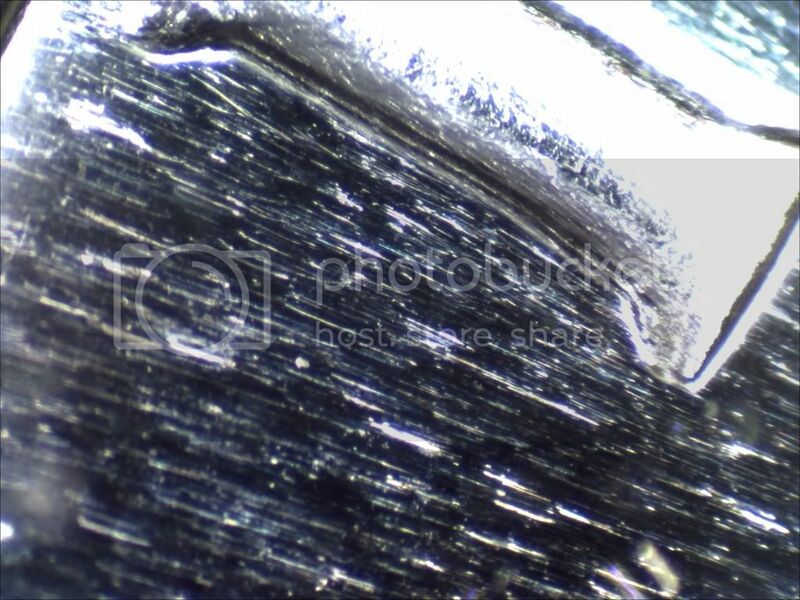 OK, the files are about 3 meg so it may/will take a bit to open - if you have the band-width be patient as it's worth it. These started as 15 meg BMP files that I converted to JPG. These coins are the best I have and I selected areas that would have the least amount of wear and tear to try and get metal that had not been altered too much. All are at the same power - 90X and all shot through the air-tites. I rechecked the focus on the Franklin and it is clear down to the open fields. You have to look at the 2007 Unc Eagle - wow and cool! The 42 Liberty and Kennedy really surprised me!!! I will have to grab a better 64 Business strike Kennedy for tomorrow. Tell me what you think! Any comments on the 2007 will also be appreciated! BTW - I am glad that 24 is toned so nicely - wow - it hides a lot!!! Pretty interesting differences. Great photos. Your explanation was very good and it made sense. 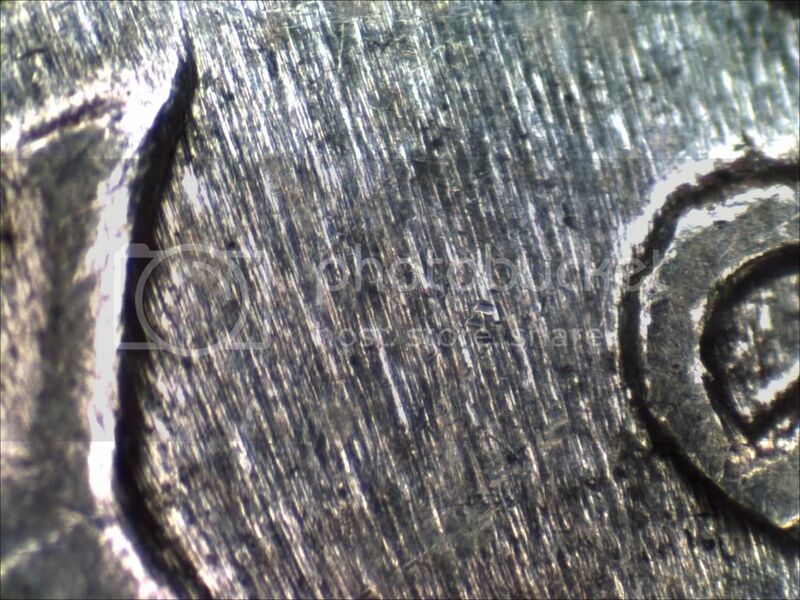 The interesting part was to look at the newer coins (40s - 60's) and see how they reverted back to a rougher surface. It probably helps to explain the toning that shows up in the newer coins. I brought in those business strike Kennedy's and a circulated Franklin to look at today. I'll try to post pictures later. Thanks Cloudsweeper99 - Sometimes pictures tell quite a story! Thanks for the kind words, but no thanks. I've written a book, lots of short stories, lots of poetry and quite a few articles. I write because I enjoy it and to help people - not to make money. I make enough money already. Even when someone offers to pay me to write - I say no, I'll write for free. For me, that's just how it is. 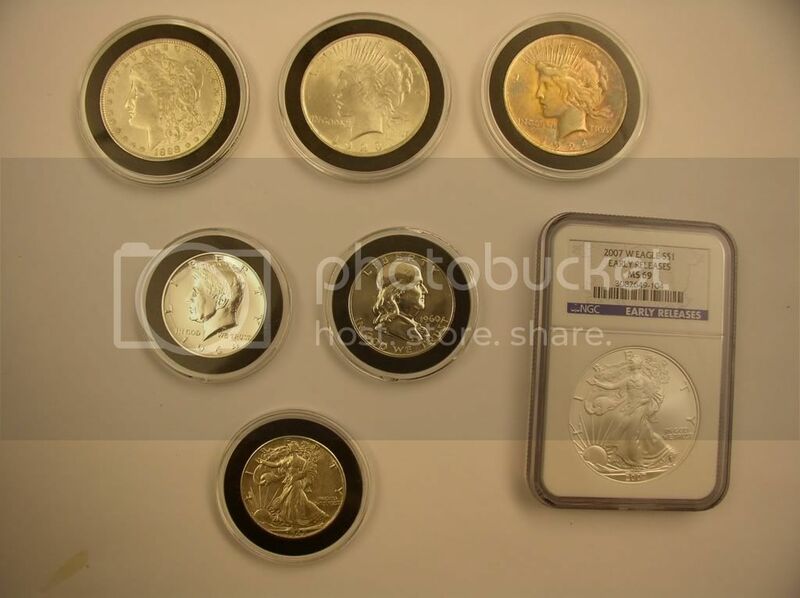 Okay - these are circulated or business strike coins. 2nd is a Business Strike 64 Kennedy. This one has a small surface issue in front of his chin where a layer is pealing a bit. 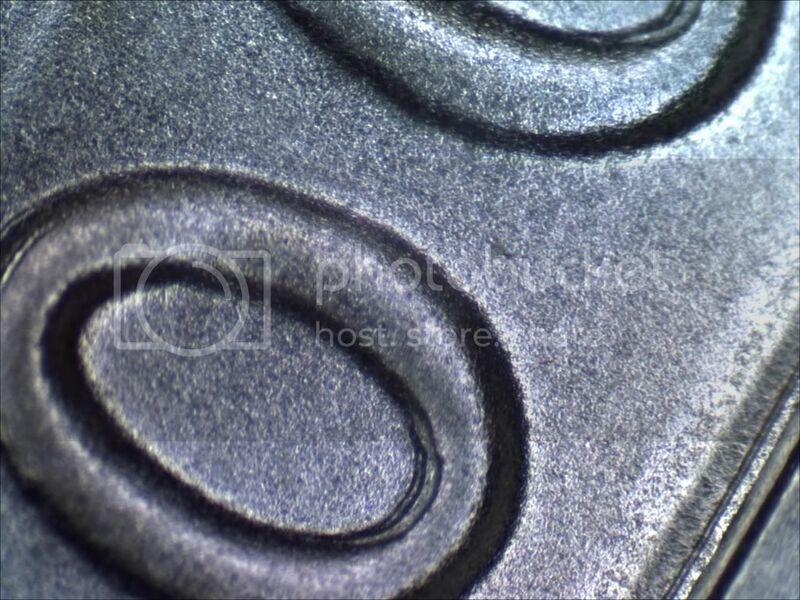 It is interesting to see how these surfaces very from coin to coin.